The China-Germany media dialogue was held in Berlin on Monday, focusing on social media and the role of international news in the spread of globalization. It was the 7th media dialogue between the two countries jointly sponsored by the State Council Information Office of China (SCIO) and the German Foreign Ministry. Andreas Michaelis, state secretary of the German Foreign Ministry, said at the opening ceremony of the dialogue that in the economic field, China is Germany's biggest partner in Asia and one of the most important partners around the world. Last year witnessed frequent high-ranking exchanges between the two countries, and dozens of dialogue frameworks have boosted bilateral exchanges, said Michaelis. Guo Weimin, deputy director of the SCIO, said at a keynote speech that since the two countries are important information producers and consumers, the development of media in both countries provided a solid foundation for cooperation and exchanges. "The China-Germany media dialogue has become an important annual event for media practitioners of the two countries to exchange ideas and strengthen cooperation," said Guo. Guo said that Chinese and German media should be committed to consolidating China-Germany strategic partnership, fostering bilateral trade and economic ties and strengthening people-to-people exchange. We should promote economic globalization, support free trade and fight against protectionism, and we should also discuss on how to report international news during a time of widespread social media, according to Guo. Over 40 media practitioners and experts took part in the dialogue on Monday. 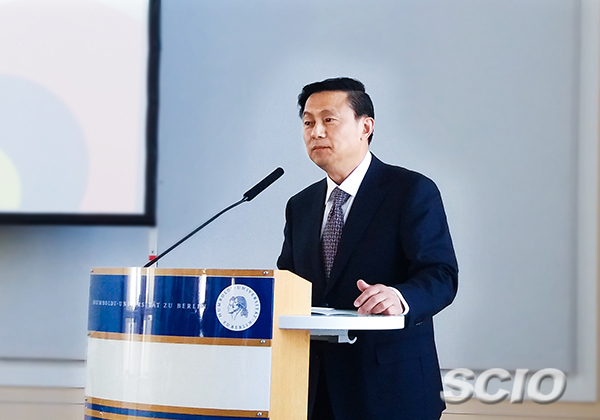 Chinese Ambassador to Germany Shi Mingde also attended the opening ceremony. Established in 2011, the China-Germany media dialogue is an annual government-to-government exchange mechanism that is held in Berlin and Beijing in turn.